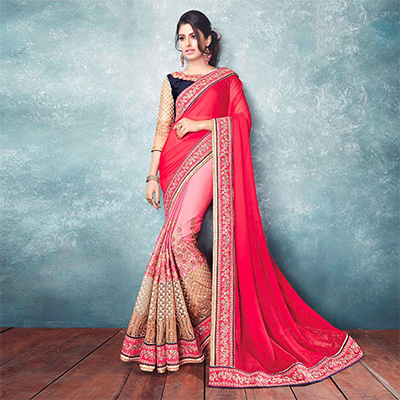 Precise splendor can come out from your dressing style and design with this pink classic designer saree. The ethnic embroidered and patch border work with the dress adds a sign of magnificence statement for your look. This saree is made of satin georgette accompanied with an unstitched chiffon blouse. Team it with stylised accessories to make your looks more beautiful. This attractive color saree would surely attract you showers of compliments when you wear it for parties functions or occasions. Buy this saree now as it's a unique piece with attractive color combination which is rare to find.